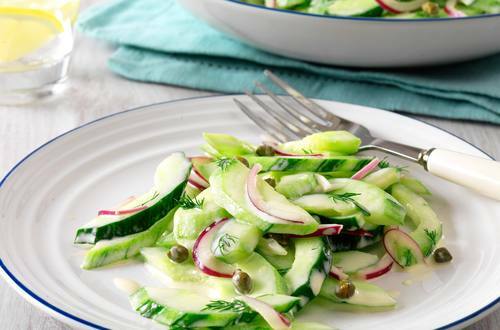 Cucumber salad tossed in a sweet and tangy dressing with soy sauce and creamy Hellmann's® or Best Foods® Real Mayonnaise. The perfect salad recipe for grilled meats and BBQs. 1 Combine Hellmann's® or Best Foods® Real Mayonnaise, vinegar, sugar and soy sauce in measuring cup or small bowl; stir in dill. Set aside. 2 Combine cucumbers, red onion, ginger and capers in medium bowl. Add Mayonnaise mixture and toss well. *Variation:  Stir in cooked soba noodles for a Japanese noodle salad.